Got some new toys with some unbelievable paint. 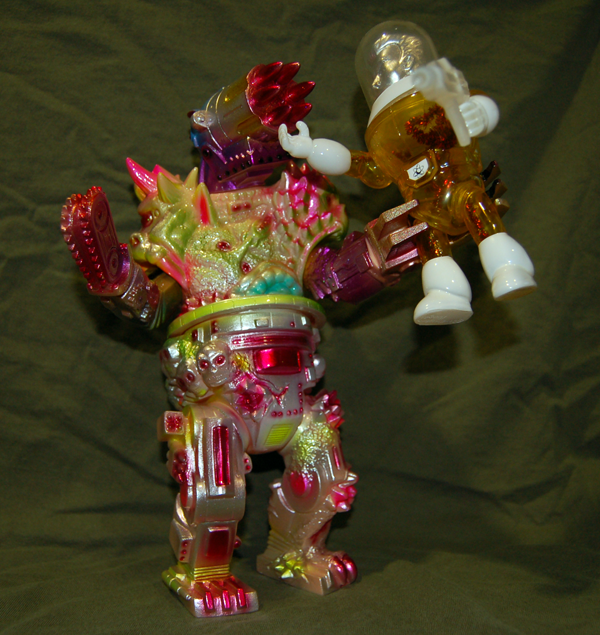 Max Toy Co mini Xam painted by Mark Nagata. Accompanied by an unpainted white mini Maxx that is just gorgeous! 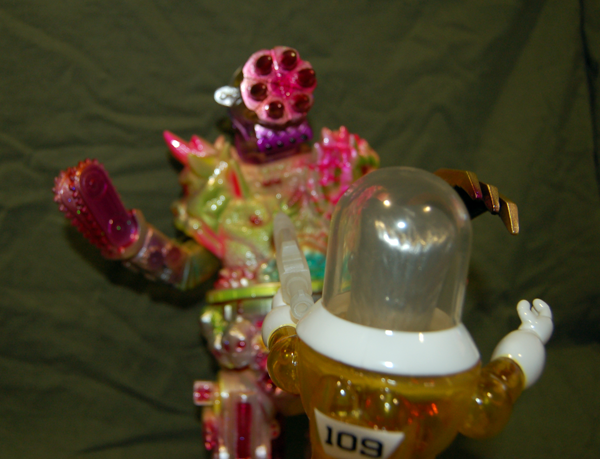 I also purchased this mind-blowing Toygraph Death Climax UFO Monster Gunhead in yummy flesh vinyl painted by the master, Dead Presidents. 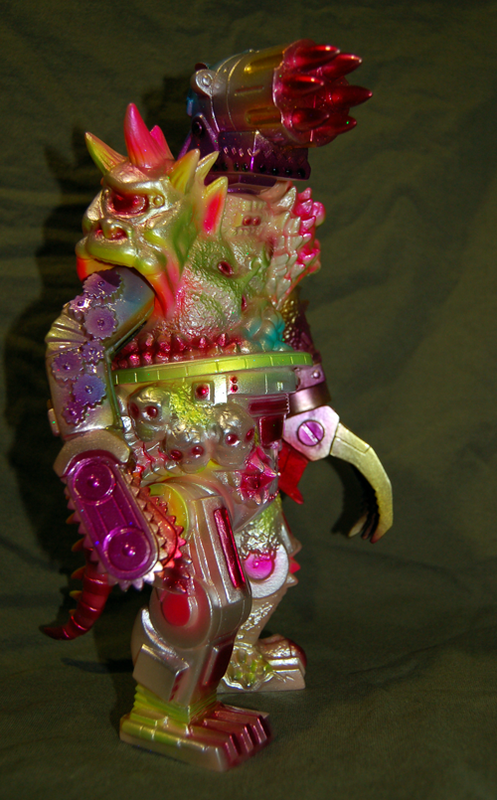 Walker pulled out all the stops, and his crazy colors and Monster Kolor paint really shine on this massive beast. The Guhead is supposed to terrorize Toygraph’s Space Troopers, but Dead Presidents’s new Cosmic Squadron troopers do everything the Space Troopers set out to do better, bigger, and much prettier. No-mad escapes from the beast’s clutches, lines up the shot his life depends on, and holds his breath! I finished the third and final pair of Space Troopers for my commission yesterday. These two are an eve more drastic departure from the style of the first pair (Soviet) or second pair (Cloud Patrol). 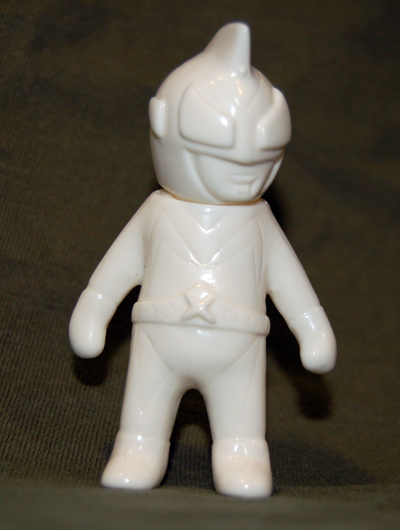 These guys were meant to be white with a basic color over spray, shiny, and much more toy-like than the other pairs. I decided that it could not get much more classic toy-style than to freehand spray almost everything on the figure. I was unsure how it would go at first, but once I got into a rhythm handling the airbrush it went really quickly and was a good time. I am really happy with how these guys came out, even though I was unsure of the idea at first. I hand brushed just a few details like the eyes and teeth in a single color each to keep it simple. It was tough to resist the temptation to go nuts with a blood spray all over the chainsaw guy, but I figured for this set he is the ice-clearer guy instead. If I did another set with a chainsaw guy in it, I’d definitely make him the berserker of the group and go hog wild!